After a few weeks of frazzling and frustrating times, rounding some circles, tying up some strings, planning, preparing, and packing, I was at the sad Memphis Airport (they are lessening it to address the blight Delta Airlines gave us with its reduction of decent flight choices), waiting for boarding when I thought I saw one of my heroes of the moment. As we boarded the plane, I found out it was - superstar Tim Howard, the goalie who made America’s soccer team shine even in defeat. He was traveling with three little boys and smiles were contagious. He was on my flight to Atlanta. I failed to have the audacity to ask him for a “selfie”. Alas. As he passed by, he had smiled at me and I gave him a thumbs up. That was sufficient. After a five hour layover in Atlanta, the flight for Quito, Ecuador set off and I was miserable because I thought I had paid for semi-beds and they were not on that plane. How was I going to pass 4.5 hours squirming - and not even TVs to watch. I’m spoiled. But after contortions and cramping, when finally, the pilot (she was female) alerted us to landing in Quito, I glanced out the window and saw this amazing landscape (dark as the night was at 10:30) holding up a city that seemed to be dressed in a gold and bronze gown of crystals. It took my breath away. Customs and immigration was pleasant and soon I was on the one hour trip to one of my very favorite hotel in my travel experiences, the Plaza Grande, 9350 feet above sea level on the corner of the old city’s central square. Its Spanish Colonial style from the 1930s and the friendly spirits of the doorman, the desk people, everybody, and the fact they welcomed me with a marvelous glass of fresh guanabana. Trust me, it hit the spot. The bedroom was decorated in rose petals. Ecuador is one of the most important exporter of long stem roses. Ecuador has a good feeling. There is plenty of poverty but a snap of happy can turn a roomful of people into a party with unabashed dancing and singing and music on crude instruments with brooms subbing for microphones - and it goes on until the last bottle of beer is empty. Bridges, highways, barrios are being built or rebuilt - positive moves that complement the humor and hospitality of its people. 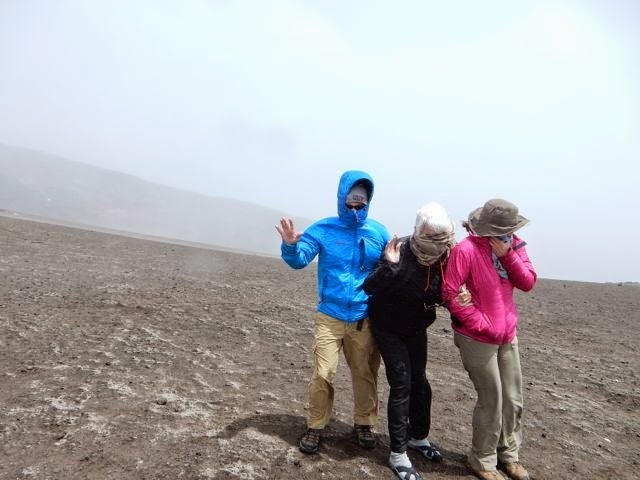 Lord knows their geography is mind-blowing - from rain drenched cloud and rain forests to volcanic rock islands and to the highest of mountains scarfed in snow that take the oxygen out of your lungs - literally. After a two hour drive our first morning we were face to face with Cotapaxi - (the neck of the moon), which, at 19,375 feet, measuring from the Equator, is one mile closer to the sun than Mt. Everest. 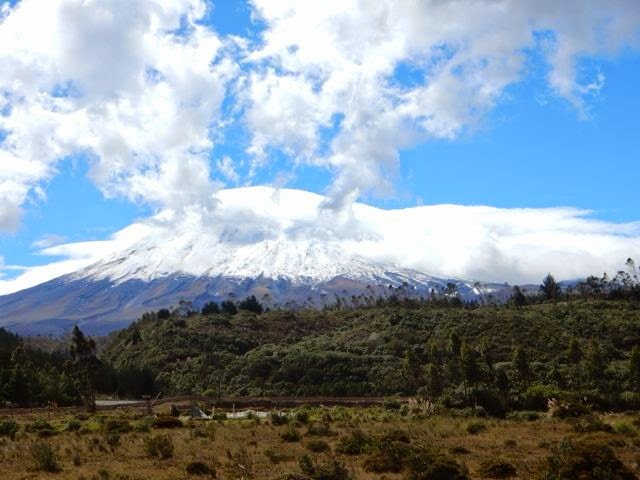 It is one of the three most perfect cone shaped volcanos in the world - the others being Mt. Fujiyama in Japan and Mt. Kilimanjaro in Kenya. (I’ve been in hiking range of both of those). 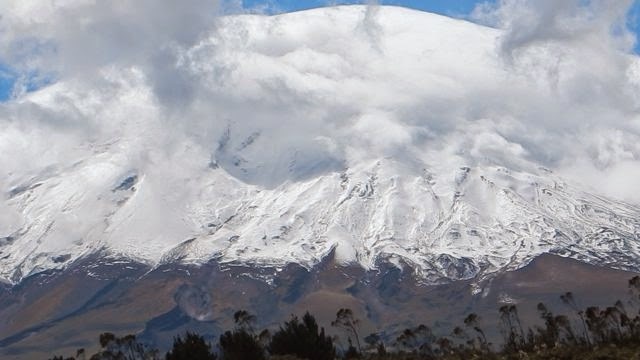 This snow capped volcano around which low, fat clouds dance all day, sometimes hugging it tightly, sometimes spitting snow flakes like bee-bees at hikers, and other times making architectural diversion for viewers, is splendid. And as you drive around the mountain in its environs, which is continually policed, you have many “WOW!” moments. 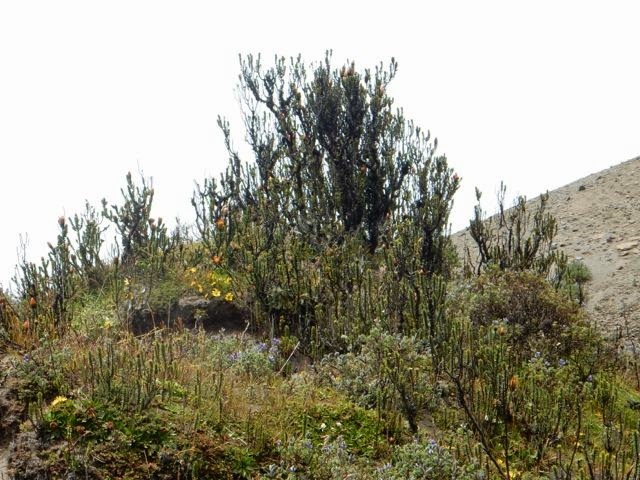 There are deep green forestal areas, and, the higher one progresses, dried desert-like areas with rare cactus-like “achupalia” (bromeliad) and even higher, the tiny tiny flowers called “paramos” with mini-leaves that flourish in high altitudes, including the Indian paint brush. There are three kinds of bromeliads, our guide explained: those that depend on roots in the ground, those that feed on trees and the “tilancias” or air plants which manufacture their nourishment with the air. Alas. 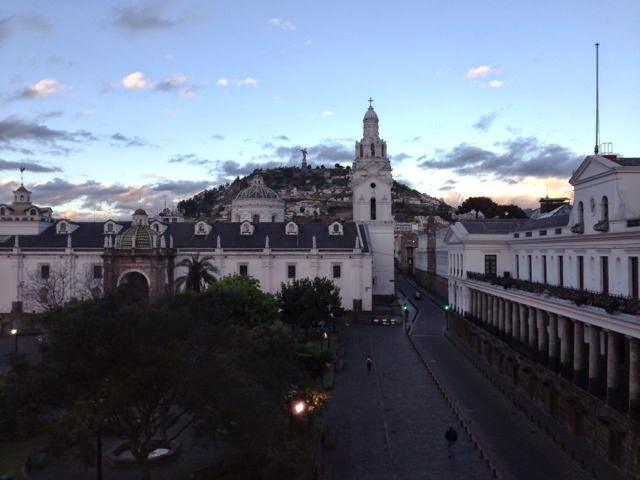 I had not even been aware that there was an altitude issue when I arrived in Quito. I didn’t realize even my hotel was at 9,000 feet above sea level and I was yet 12 hours out of Atlanta which is relatively sea level. When we drove up as far as vehicles could pass (the road was difficult but there were bicyclers puffing their way up the curves) we had reached about 13,000 feet. 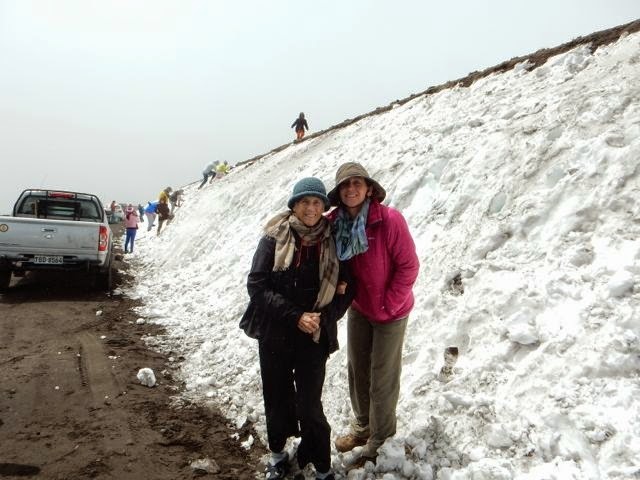 There had been no acclimatization at all!! The wind at that level was deadly and really for the first time in my life I appreciated gravity. It was impossible to stand in the wind which at this moment was throwing those bullets of snow all around. But we had to take a picture, no? Could not even get the door open unless we were parked in the right direction. So we clamored out, my scarf almost hanging me on a cloud, and walked a few feet upward - snap snap for the photo and quickly returning. A wooze swept over me. My legs felt like noodles and I was so dizzy I could hardly arrange thought. I knew better - about acclimatization and was sort of in denial. Jim Williams had taught me better. (I’m not normally affected by altitudes but this was high. 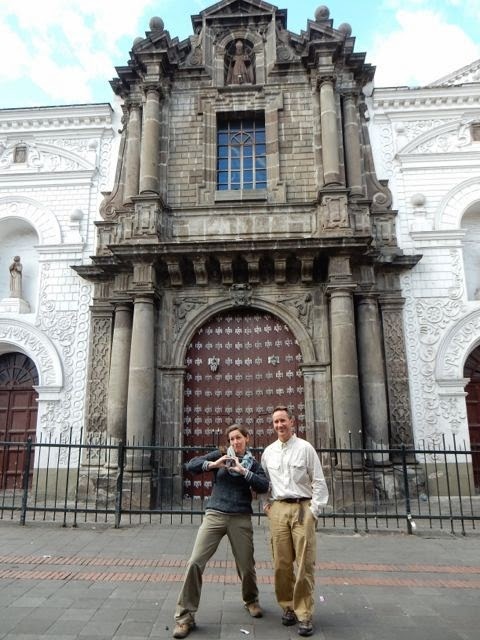 My daughter Mary and her husband Doug had already been in Ecuador for a week. They were good. Now if I had been in shape and the wind not so devastating, we would have walked 400 feet higher to a sort of way-house where serious climbers can get shelter if they are climbing to the top. (The serious hikers start the final accent at 11 p.m.). At this point, the weather was so in charge, I wondered if the car would even be able to stay grounded and not fly off into those beautiful clouds. But we had a great guide who knew the ropes and so we stayed our ground and worked our way down only slightly to the only place to get a meal in the entire park. I was still too high and really thought I’d have to sit down on the stairway to the entrance. Lunch helped - and sips of a Sprite as in my other days of climbing in high places. Dessert was a tree tomato decorated to look like a mouse. It was such a gustatory delight - boiled in some sort of syrup and served cold. I’m looking for tree tomatoes when I get home. 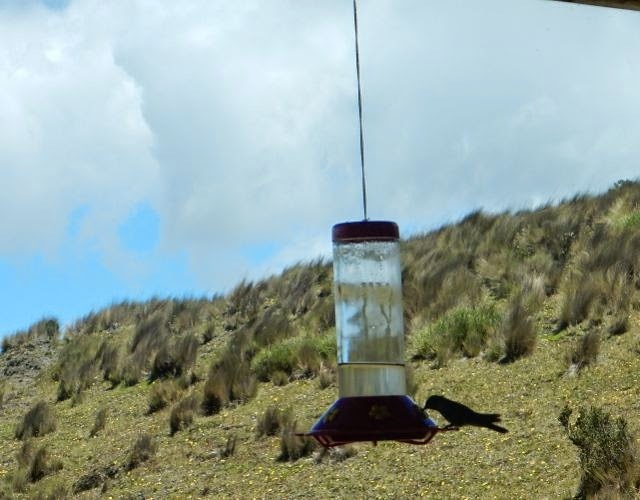 While at lunch, we saw in action the white chested hummingbird which is the only one of its species that can live this high up. The chef had a feeder outside the huge windows and so we had been there at the right time. Quitenian Serenade - “a wine is not fattening but delivers truth: two glasses of wine give half truth; three glasses of wine the whole truth. 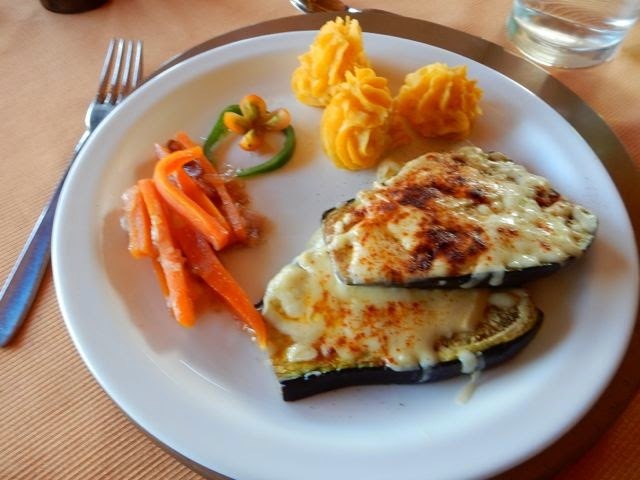 We tried green plantain morocho with wind patties: made with green plaintains and filled with cheese. It is said “the desire to eat this patty and discover what’s inside, is the same feeling that allowed humanity to discover the world and get surprised with the real heart of things.” Hmmmm. Food has its wisdom, or “yache”, I guess.